He notes that the WEA and the Pontifical Council have just completed seven years of dialogue, culminating in a joint document on Scripture and Tradition. While major theological differences remain, he says, it’s increasingly important to “look for a common agenda”, rather than “focus on what differs and what pulls us apart”. Prior to his appointment as head of the WEA, Bishop Efraim served as for over 20 years as National Director of the Philippine Council of Evangelical Churches and as President of the Philippine Relief and Development Services, working to support the poor and needy. In the country which is 80 percent Roman Catholic, he says ecumenical relations are very good and he was recently asked to address a retreat for the Filipino bishops conference. There is also strong practical cooperation on issues including human trafficking, combating climate change, fighting corruption, promoting peace, and providing relief and development for victims of the many typhoons which affect the region. Also attending the papal audience was Rev. Thomas K. Johnson, the WEA’s Religious Freedom Ambassasdor to the Vatican. He explains why there is an urgent need to join forces to combat the increasing persecution of Christians worldwide. Johnson notes the problem is not confined to one particular area of the globe but he says the last three years may have seen the worst persecution in the whole history of the Christian Church. He recalls the important international consultation that took place two years ago in the Albanian capital, Tirana, on discrimination, persecution and martyrdom. 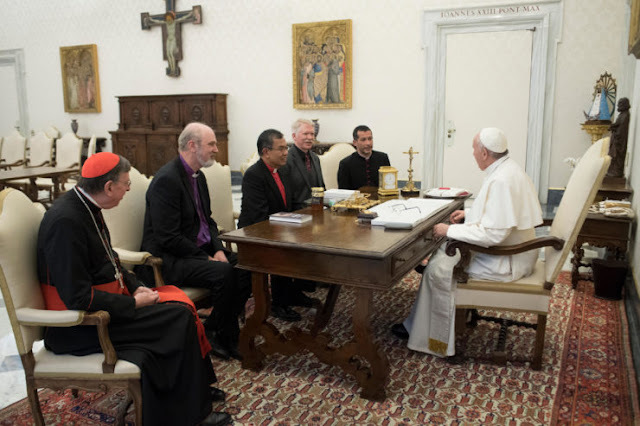 Representatives of the WEA, the Vatican, the World Council of Churches and the Pentecostal world discussed ways of responding to the problem “in a unified manner”. While Johnson admits there are still problems of discrimination between Evangelicals and Catholics in some countries, he adds that Evangelicals have always been made to feel “very welcome in the Vatican”. As a philosophy professor and human rights specialist, he is particularly interested in Catholics and Evangelicals publishing “education materials that we’ve developed together”. While no-one is expecting any major pronouncements from Thursday’s meeting, he says the small steps undertaken together can lead “to a broader coalition over years” and reinforce the message that, “Christians of all varieties need to be protecting each other in the public square”.